A motion to approve the ‘for’ statement with any minor grammatical adjustments necessary was approved 5:0, with Councilors David Sewell and George Handley excused. A motion to signal to Public Works that the Council is interested in exploring the possibility of a $120 million loan from the Utah State Division of Water Quality was approved 7:0. 3. A discussion on equipment for fire station diesel emissions (18-087)(18-081) Presentation only. This item was already scheduled for the September 25, 2018 Council Meeting. 4. A discussion on a request for a code amendment to Provo Code Chapter 14.20 (SC3 Zone) to establish an open space requirement for the residential portion of mixed-use developments within this zone. Citywide impact. (PLOTA20180113) Presentation only. This item was already scheduled for the September 11, 2018 Council Meeting. 5. A discussion on a request for a code amendment to Chapter 14.41 of the Provo City Code regarding various changes to the allowances and requirements of Home Occupations, including but not limited to the addition of certain definitions related to Home Occupations, limitations on promotional meetings, changes related to the number of customers and employees allowed with major home occupations, and the non-allowance for an accessory apartment and a major home occupation to be operated at the same time. Citywide impact. (PLOTA20180109) Presentation only. This item was already scheduled for the September 11, 2018 Council Meeting. 6. An update on City budget carryovers (18-005) A motion to place $50,000 from the Council FY18 budget [appropriated for budgeting for outcomes] back into the General Fund balance was approved 7:0. 7. 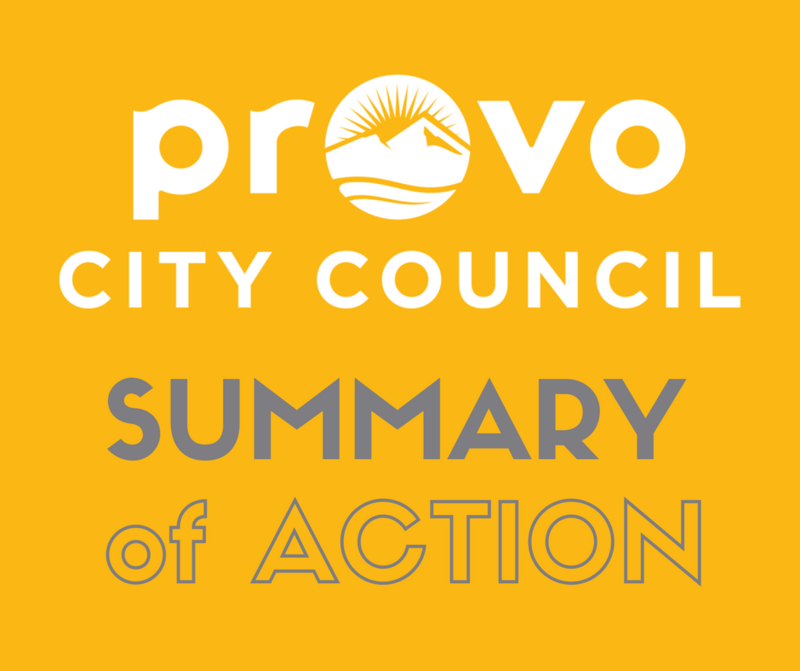 A discussion on the Second Amended Interlocal Agreement between Provo City and Utah County regarding the Westside Connector (18-085) Presentation only. This item was already scheduled for the September 11, 2018 Council Meeting. 8. A presentation by Hansen, Bradshaw, Malmrose & Erickson regarding the audit of the City's financial statements and activities for fiscal year 2018 (18-006) Presentation only. 9. The Municipal Council or the Governing Board of the Redevelopment Agency will consider a motion to close the meeting for the purposes of holding a strategy session to discuss pending or reasonably imminent litigation, and/or to discuss the purchase, sale, exchange, or lease of real property, and/or the character, professional competence, or physical or mental health of an individual in conformance with § 52-4-204 and 52-4-205 et. seq., Utah Code. A closed meeting was held. 1. A presentation introducing the Provo Youth City Council. Presentation only. 2. A presentation from the Justice Court of the Justice Court annual report Presentation only. A motion to direct that a study of the proposed parking area be undertaken was approved 7:0. 5. 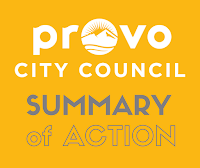 An ordinance amending Provo City Code Chapter 14.41 (Home Occupations) to better preserve the residential character of Neighborhoods. (PLOTA20180109) Per Council Rules, during the first of two hearings of a Planning Commission item, any Councilor may request a continuance and have the request granted; Councilor David Knecht requested that this item be continued. This item will appear on the September 25, 2018 Council Meeting agenda for a second hearing. 6. A resolution authorizing the Mayor to approve a Second Amended Interlocal Cooperation Agreement with Utah County regarding a highway project known as the "West Side Connector." (18-085) Approved 7:0.